Cover of Thelonious Monk Quartet with John Coltrane at Carnegie Hall. 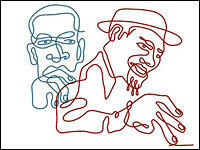 Fresh Air from WHYY, October 7, 2005 · Jazz critic Kevin Whitehead reviews Thelonious Monk Quartet with John Coltrane at Carnegie Hall. It's a long-forgotten recording of a 1957 benefit concert, which has never been released until now.